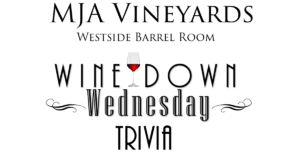 Grab all your smart friends, or at least the ones who are always spouting “useless trivia” and head on down to MJA’s Westside tasting room trivia night in the Barrel Room! Sip wine, have fun, and take your shot at a $30 MJA Gift Certificate. The topics will be: Popular Presidents, That’s SO Santa Cruz, Vino Vibes, and Name That Movie Quote. We’ll see you there!